A Genocide Perpetrators’ Mole Within The BBC, Or A Reformed Man? It is September 1994, in Goma in the Democratic Republic of Congo (DRC), then still known as Zaire. The high command of the defeated Rwanda military who had fled there, convene a four – day meeting to decide on strategies for continuing the war, which they hope will bring them back to power in Rwanda. The decisions of the meeting are to be submitted to Theodore Sindikubwabo, the-would-be President of the self-styled government in exile. It is delivered by Major-General Augustin Bizimungu, formerly head of the defeated Rwanda army, now Chief of Staff in exile. One of the strategies agreed by the meeting is to win over the support of the world community. An important tactic for achieving this, is to encourage the journalists known to be part of their cause, to seek positions in major news organisations around the world, and from there, keep their story alive sympathetically. In their words, “encourage by all means the placing of our journalists in media houses, who would be useful to us, and establish links of correspondence with them”. 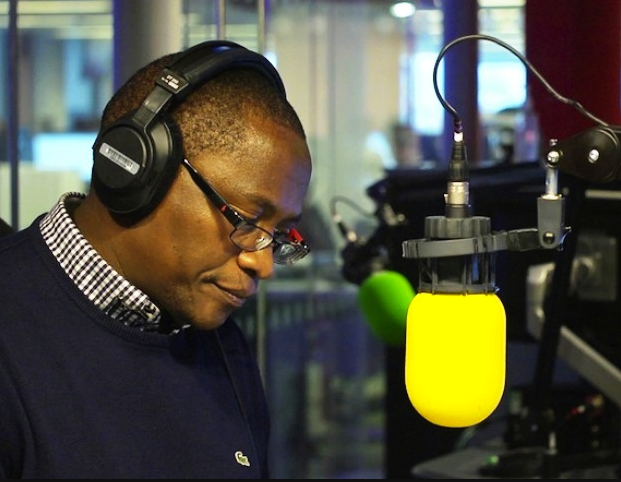 Few individuals fit the profile of these “useful journalists” better than Venuste Nshimiyimana, who for over two decades has been working at the BBC’s Africa Service, in London. During these two decades, Nshimiyimana has been carefully cultivating what is in essence a new identity, as a survivor of the 1994 genocide against Tutsi in Rwanda. The reality however, is that he was at the very least, a cheerleader for those who planned, and perpetrated it. It is not clear what position Nshimiyimana held within the genocidal establishment, but, judging from his own communications, and his associations it was privileged and influential. In October of 1992, he was commissioned to carry out a research exercise. The final paper, “The Socio-Political Situation Facing the MRND: findings, and analysis and strategies” was delivered to then President Juvenal Habyarimana. The exercise was in effect to assess who among the ruling MRND (Republican Movement for Democracy and Development) leadership could be relied upon, ideologically, and who could not. In putting it together, Nshimiyimana interviewed those in positions of leadership, from Prefects, Burgomasters, Bishops, priests, opposition leaders and some among ordinary people, to gauge their opinion. Some of his recommendations leave us in no doubt as to where he stood. In Gitarama prefecture for instance, he advises the President that recruitment for the Interahamwe militia should focus on domestic workers, motorcycle taxi riders, carpenters, and artisans. “It is from this demographic” he advises, “that the true Interahamwe can be found”. As the world now knows, it is the Interahamwe militia who would be unleashed in the mass murder of men, women and children that was the 1994 genocide against Tutsi. In his then home prefecture of Butare, as in Cyangugu, Kibuye, Nshimiyimana recommends that the recruitment of Interahamwe militia be fast tracked, noting that in Cyangugu especially, “MRND members are asleep, and we need Interahamwe there”, to inject more energy into the party. He adds that the propaganda machine was also particularly weak, and something needed to be done about it. He does however say how gratified he was to see so many Interahamwe, at a Petrol station in Gitesi. “This is to be commended” he observed. And Nshimiyimana strongly advises the President to give the CDR (Coalition for the Defence of the Republic) greater prominence. CDR was created by the more extreme members of the ruling MRND, who considered the ruling party too soft on Tutsis, and wanted a more uncompromising stance. In 1992, the security situation in the country could not have been more tense. Only a highly placed, trusted individual could have travelled around the country, asking sensitive political questions, and in what was still a particularly hierarchical society, asking these questions of highly placed people in various positions of leadership. Not only from his writings, but, also from the company he kept, we know that it is a position Nshimiyimana had earned. He was on the steering committee at the founding of Radio Television Libre des Mille Collines (RTLM), the hate radio, which would become the voice of the genocide, presented by the notorious Ferdinand Nahimana, the so called “Rwanda’s Goebbels”. The steering committee was chaired by Felicien Kabuga, the chief financier of the genocide, who today is still on the run, and virtually the entire leadership of the Interahamwe militia. It was this steering committee which established RTLM’s editorial line, down to the type of content it should broadcast. Nshimiyimana was also a contributor to Kangura Newspaper, the other genocidal media organ. It was Kangura which published the infamous “Ten Hutu Commandments”, on how Tutsi should be regarded by Hutu. The eighth commandment for instance, “Hutus must cease having any pity for the Tutsi”. In the December 1991 issue, Nshimiyimana writes of the Rwanda Patriotic Front (RPF), as “enemies of Rwanda, of man, and of nature”. Throughout, he refers to “Inyenzi” or cockroaches, the genocide establishment’s preferred term for the RPF and Tutsi in general. For him however, Kangura was not enough. In his recommendations to the President, he calls for a newspaper that would be dedicated to highlighting the achievements of the purported Hutu revolution of 1959, which overthrew the monarchy, and to promote MRND, as the only Hutu party. Nshimiyimana was sort of reminding his boss to run-through Kangura’s 10th Hutu Commandment: “The 1959 social revolution, the 1961 referendum and the Hutu ideology must be taught to Hutus at all levels. Every Hutu must propagate the present ideology widely.” Most of his recommendations would be echoed on RTLM during the killings in 1994. When the United Nations Assistance Mission for Rwanda (UNAMIR), arrived in Rwanda in late 1993, Nshimiyimana became an employee of the mission as an Information Officer, referred by the Rwandan government. From being what was clearly an important cog in the genocidal machine, Nshimiyimana reinvents himself in 1994. In 2014, he writes, “20 years ago, in this school…known as Don Bosco. I found refuge with some 2,000 other fellow Rwandans, hunted by killers who sowed and spread death around the country”. He rightly points out that the genocide had been long in the planning, but, draws a discreet veil over the fact that the Interahamwe militia, which he so enthusiastically promoted, whose expansion he recommended, were an important part of that plan for mass annihilation of the Tutsi. In 1992/3, Nshimiyimana writes to the Ministry of Defence, asking for permission to carry a gun, which was granted. None other than Theoneste Bagosora, the de facto leader of the genocidal government, would have had to sign off on such a request. “When it started”, Nshimiyimana writes of the genocide, “we ran across the capital, aiming for this school. It was our hope of escape.” As someone who had been in a position to advise the President about which individuals to promote, and which to leave out in the cold, a man who had sat on a steering committee which decided the editorial content of RTLM, such a man could have had nothing to fear from a system to which he was clearly a faithful servant. Among those he endorsed as good, and virtuous people who should be advanced, were Mathieu Ngirumpatse, Edouard Karemera, Francois Karera, Jean Baptiste Gatete and Ferdinand Nahimana himself, all of whom were to be convicted for their part in the genocide by the International Criminal Tribunal for Rwanda (ICTR). For Nshimiyimana to now include himself among the survivors of the genocide is little short of mocking those who did manage to escape those “killers”, and more so, the more than a million who did not. There is no suggestion that Nshimiyimana was involved in the physical killings, but, if Ferdinand Nahimana could be convicted for his part in urging on the murderers, surely someone who with such prominence in RTLM, someone who advised greater prominence for the extremist wing of the genocidal establishment—CDR, the expansion of the Interahamwe militia, has a case to answer. Even more damning, when Nshimiyimana recommended an increase in the numbers of Interahamwe militia, he knew from past massacres what the Interahamwe were for. He was knowingly demanding an increase in the number of mass murderers. It is perfectly possible that he may be a changed man, who regrets the person he was. Hundreds of thousands in Rwanda have been forgiven for their role in the 1994 genocide against Tutsi. The difference is they showed, or at least expressed contrition publicly apologised. Nshimiyimana has chosen the route of deception, donning the mantle of the hunted, when he ran with the hunters. Is he still to this day “one of our journalists, who can be useful for us”, as intended in that Goma meeting of 1994? Because he has chosen to clothe himself in the innocence of a genocide survivor, rather than truthfully state his position then, and now, we can have no way of answering this question. The government of Rwanda closed down the Kinyarwanda/Kirundi programme “BBC-Gahuzamiryango”, which they accused of promoting the agenda of that meeting in Goma, in 1994. Their action has been roundly condemned as an attack on free media, but, the world too quick to judge, without possession of the full facts. The Rwanda government had a point. What Could Have Motivated The 1961 Gitarama Coup In Rwanda?